All Marineland Penguin BIO-Wheel Power Filters deliver simple, easy, 3-stage aquarium filtration...without the hassle of air pumps, valves, tubing or air stones. Penguin Power Filter aquarium water filtration maintenance is fast and easy. 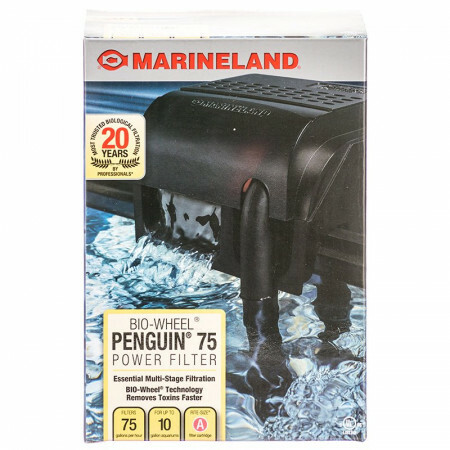 Convenient Marineland Penguin Power Filter Rite-Size Filter Cartridges come ready to use with each filter. 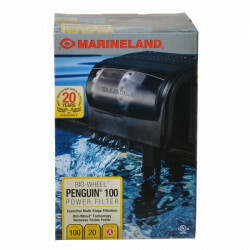 Marineland Penguin Bio Wheel Power Filters remove waste, discoloration and odors. Each Penguin Power Filter contains new filter cartridges for maximum efficiency. Bio-filtration is provided by the revolutionary BIO-Wheel. Hang on back HOB power filter for easy installation nd maintenance of your fish tank. Includes: BIO-Wheel Cover, Filter Cover, Impeller Housing, Impeller, Intake Tube, Mid-Level Intake Strainer, Extension Tube, Strainer, BIO-Wheel(s), BIO-Wheel Bearings, Filter Box, and Filter Cartridge(s). I purchased 2 filters for my corner aquarium for what it would have cost to purchase one in a store. The filters are easy to use and work great. Thank you Pet Mountain for carrying quality products at affordable prices. I would definitely recommend this site to others. This filter came in great condition. Easy to assemble and the bio wheel runs like a charm. Can't wait for my new fish. When working this is a very good product. It cleans the tank beautifully and is very very quiet. It is used in an aquatic turtle tank - we feed the turtle outside the tank, not in the tank - so this helps keep the tank water clean. Only problem is it wears out fast - 2 - 6 months - still like it. And a shout out to Pet Mountain, which has been a great company to deal with both online and by phone - thank you! Best Bang for your Buck for anything 75 gallons and under. I'll bet you won't find it cheaper anywhere else!!! 5 stars for Pet Mountain they're the best for service and shipping! I'm not so keen on this Bio Wheel though, it doesn't work nearly as well as other filters I've used. I have 2 on a twenty gallon tank, one is for a 20 one for a 50 gal. should be more than enough to keep it clean. 4 medium fish in the tank so it's not that. Back to Fluval for me. Worth a try though I know lots of people love it. Got the penguin bio wheel rated for a 75 gallon tank even though my tank is only 29 gallons, but it is home to 2 good sized celestial goldfish. Had two smaller bio wheels on this tank before and the fish were ok. Now with the improved filtration they are definitely happier. This is their temporary winter home and they will go to their pond in spring, but for now the fish are doing great. Excellent filter and works well on a smaller tank (but with bigger fish) too. Don't know if it would create too much water movement if you keep small fish in a similar sized tank. Love the double intake valves, one at the bottom and one higher up, which can be closed too. It provides for even better water circulation in the tank. The Penguin Bio Wheel Power Filter by Marineland was just as expected. It does exactly as it states. Quiet operation and so far has kept the water quality necessary to substain the fish. Also very helpful in keeping the tank clean. I really enjoy having the penguin bio wheel filters. I have one for my 55 gal. tank so bought this one for my 10 gal. I am pleased with the purchase. The filters were delivered sooner than expected. We like how they operate and their quietness. The cartridges could have been of a better quality. Overall we are very satisfied. What a difference! My water looked better very quickly, and my fish are much happier. This is a very good quality power filter. The price was right too! This was a great product, prices and quality can't be beat! I purchased a biowheel 150 several years ago to replace my Aqueon filter and immediately noticed how quiet it is. With the 150, all you can hear is the running water. All I've ever had to do since is replace the filter media once every month or two. I highly recommend this to anyone wanting an effortless HoB filter. This filter is amazing, I'm using the model 100 that came with my tank starter kit and it works amazing! I do plan on getting a bigger tank in the future and continuing to use penguin filters. But be careful if you have small bottom feeders, mine will swim up and get in there. Maybe an improvement could be that there's a screen or net over the outlet so fish cant get in there! Either way, love it. This filter system keeps my 29 gal. saltwater system crystal clear and is very fast about clearing the water after partial changes and vacuuming. It is true that at first the bio-wheel splashing is a bit noisy, but like another reviewer says the splashing sound is minimized after a week or two to an unnoticeable level. Definitely keep your water levels up to avoid extra noise and water splashing out of the tank and onto the hood. This system works great and I would definitely recommend! The Bio wheel for this product is a bit noisy. Otherwise, this product works fine. Nice filter, I wouldn't call it as good as an aquaclear but for half the price it definitely fits the bill on a 10 gallon tank. I got rid of the original filter insert and replaced it with a sponge for aquaclear 50, and a biomax made for aquaclear 50, use the bio wheel as well. I just figure you can never have enough bio filter. Well you really can't beat the price on Penguin filters when you buy from Pet Mountain. I got a 200 to replace a worn out one that needed a new impeller. It was only $6 more to buy a whole new unit instead of the part! I've ran these filters for quite a while and really for the cost you can't complain, they just work. I purchased the Marineland 150B about a year ago. It was purchased to replace an old non functioning other name brand filter. This filter is quiet, keeps my 20 gallon tank sparkling clean, and the filter media can be purchased from Pet Mountain in 6 packs to save LOTS of money. Pet Mountain rocks!! This filter is very inexpensive and performs like a filter that SHOULD cost 4X as much! Using Pet Mountain saved me about 1/2 price vs. shopping local retail. GET YOURS!! I purchased a 350B for my 38 gallon. It really did the job. I obtained a 55 and put a 350B on that one also. They both do an incredable job of keeping the aquariums clean. I discovered that the noise of water splashing is caused by low water level in the tank. Keeping the water level up, keeps the noise really low. When I set up my 55, I took the two dirtiest filter elements out of the 38, and put them into the filter for the 55. I also took ONE of the used nio-wheels out of the 38 filter and placed it in the 55 filter. Then I put one new bio-wheel in the filter of the 38 and the other new bio-wheel into the 55 filter. That speeded up the cycling of the 55 gallon. If I ever get another aquarium, it will also get a bio-wheel type filter. The water remains clear and clean. I put a Bio Wheel 350 on the 55 gallon aquarium that I maintain at the school that I work for. The filter has been in use now for 5 years without any problem whatsoever. Everyone comments on what a beautiful tank we have and how much work it must be to keep it that way and I'm able to say that with the filter that I have on it, it really isn't very much work at all - just change the filter cartridges once a month or so and do partial water changes every so often (nowhere near as often as it should be done!) and it is good to go! I do keep four cartridges in the filter because the fish load is kind of heavy with 2 huge plecos, 2 very large angel fish, neons, white clouds, a rainbow shark, a catfish, and four other tetras. Water's clear, no odor, and happy fish. I do have a power head with an undergravel system which is there more for extra oxygenation than anything else. I also have a smaller Bio Wheel at home on a 45 gallon tank that I've had for at least 7 years and never had a problem with it, either. Would buy another in a heartbeat. Powerful Filter For 29 GAL. I have the Penguin 350B. It does a great job on my 29 gal. tank. The water is crystal clear. Changing out media is a snap. Some say that it is quiet, others say it is noisy. I say it is in between. I have had filters that did as good a job as this 350B but, they were canister filters. I really like the wet/dry bio-wheels. A lot of surface area for bacteria. The filter does require a little clean up from time to time but all other filters do too. The 350B may be a little bit to powerful for a 29 gal. tank. The surface water is kinda like rapids. Fast moving. So, if you use this filter on a 29/30 or smaller aquarium it would be best to house fish that like that type of water. Mine does! So, for the price, this filter is worth every penny. For what it does it is cheap! Just remember to maintain the filter as instructed by the manual and you will be very happy. I have the Penguin 150B and it is the perfect filter for my 30 gallon fish tank. It is SUPER QUITE and ROCK SOLID. It puts plenty of oxygen back into the water by moving lots of water. I would recommend to anyone. It's a very dependable filter and easy to clean. This filter keeps the tank crystal clear! I love it! I was skeptical about this filter because of it's low price. I was wrong! What a great filter!! It keeps my 20 gallon tank sparkling clean. Filter elements can be rinsed several times to save money on replacements. Replacement filter elements are very inexpensive. Great value!! I have read the other above reviews complaining about noise...my filter is whisper quiet and doesn't make a sound. Perhaps the other reviewers have their filters set up improperly? I had old filters for 2 tanks that I was trying to set up in my classroom at school. It was cheaper and easier to buy 2 new ones and know what I had, than to try to find oddball filter cartridges all the time. They are great filters for what I need. This filter is excellent and you can not beat the price. Item shipped fast and was as expected. The Penguin Bio Wheel power filter works great! Thanks! I love love love this filter because it's so easy to set up, replace cartridges, does an amazing job filtering, and it's so WONDERFULLY QUIET! I have Marineland filters in my 5g Hex, one each on my two 55g tanks and another on my 20g tank. Great buy for the price! Will get another in a heartbeat! At first, the filter made horrible splashing noises as the water came out of the filter. I even made sure the water was high enough. Ends up that I had the water a little too high; it is much nicer when the tank water is at the level of the exiting water. Also the biowheels had to become "absorptive" after a period of 24-48hrs. I have the filter on a 55g tank in my bedroom, and it is VERY quiet. The soft trickle of water is even a little soothing. Water is still crystal clear so far...Love this filter! Penguin mini filter works great. A lot more powerful (flow) than the previous earlier model mini we had. This is a great filter, made my 55 gallon crystal clear in a few hours, great investment. You don't even know how bad your old stuff is until you replace it. Best price I could find on the net. 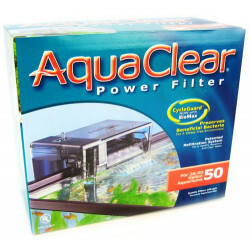 I have this filter in my 45 gallon tank and it does a great job! The filter isn't dead silent, but it nice and quiet. Marineland had great products so if you're torn, I recommend this filter. Not As Good As I Expected But It Does The Job! I bought the Penguin Bio-wheel 200 for my 33 gallon tank. It does a good job, but it does not do it as good as i expected. I still have to sweep out my tank every 2-4 weeks. I do not overfeed them and the Nitrate and Nitrite cycle has already set up. I have about 15 fish so it's not overpopulated either. But i think that it is definitely worth the money and does the job... the filter media is not too expensive either. I later bought the Marineland Emperor 400 for the 33 gallon tank. I was going to buy the 280 but there was only an $11 difference so i said u cant have too much filtration right? I've had the 400 for about 5 weeks now and I have not had to sweep out the tank yet, so i am very impressed w/ it. i Definitely recommend the Emperor. It's my first time to set up my fish tank, don't have experience to do comparison. But I can see this filter work very well, strong enough to clear my 60 Gal tank. I have a Bio Wheel Power Filter Lid system on my saltwater tank and it works great! It is a full hood unit on a 29 gal tank. I am looking at buying another one for my 55 gal tank!! Very easy to maintain! 350 Bio Wheel unit better packaging , but does not have the flexibility of the 330 unit, such as pockets for charcoal or ammo chips allowing user to adjust filtration system for specific tank conditions. This is my first tank (55 gal) and first filter so I would say its a good filter not having had any experience with any other filter. My tank was cloudy after I added my pebbles, but it was clear the next day. I would say it is relatively quiet. The only time that you can hear the motor is when there is absolutely nothing going on in my apartment and at that time it is still not bothersome.
" my tank is poop & food free "
I am an avid turtle keeper. I use this in a 55 gallon tank full of water. In the tank there are two full grown Helmeted turtles, this might not mean much, but simply put. These are VERY messy turtles. This filter keeps the water crystal clear all the time, one of the best! I was replacing a Penguin Bio Wheel Power Filter by Marineland that was at least 15 years old (maybe more) and I was so impressed with the longevity of the one I had that I bought the new version of the same thing! It is up and running (very easy to set up) and works great. Penguin 350B Fantastic all way round! Re: This post about using copper. COPPER is highly toxic to all fish (used in meds for short duration only and many no longer use it as it stays in the fishes system ie heavy metal) and kills the bio cultures and inverts. Please research this and DO NOT use copper pipes or tubing. (I have to prefilter all my water due to copper pipes in the building). <<350B Impeller Noise By Steve from Ringwood, NJ On January 21, 2008: The Penguin 350B was very quiet for four months, then the impeller started making noise. When it does, you have only weeks or days before it stops working completely. A very good fix is to go to your local hobby shop and rebuild the plastic shaft from copper tubing. It will take a bit of effort but is worth it in the long run. >> That said, I've used many of these filters (different sizes) and overall a great product. I pack my own filter bags and if you wish to extend the tubing use plastic. This is a great basic filter. It's easy to put together and easy to take apart. I actually use it for our turtle so I have to clean it more often than a person with a fish aquarium would, but if it works so well with a turtle, it must be perfect for a small fish aquarium! The waterfall provides soothing noise. Only downfall - the waterfall sounds great but tends to splash. Leave it away from items easily water damaged or likely to stain from hard water deposits. I've had the old ones, the mini, the 170, tried Rena and had lots of problems getting the bio to get established enough to absorb the nitrates & ammonia. Came back to the bio wheel with a 100, 150 & a 200. Gets the tank going right away, although the initial noise level is high, it quiets down after it loosens up. Still a loud tinkling of water sound, so if you don't mind that, it's good as it is adding oxygen. I am using the 350 as a bio/chemical filter on my 75 gallon tank (I have a 350 magnum set up for mechanical filtration on the tank also). I have a foot long sailfin pleco with other community fish and the 350 magnum was great for mechanical filtration, but I was always battling ammonia and nitrates/nitrites. I added the 350 penguin and saw improvements very quickly. It runs quietly and smoothly and is easy to clean. I added the extra filter baskets with Purigen, plus Supercartridges with carbon pads and couldn't be happier!! Great Filtration for the Price! I was skeptical about bio-wheel filtration, but let me tell you.... The Penguin Bio-wheel 350B keeps my 55 gallon cichlid tank in perfect condition. The Penguin Bio-Wheel 100 has done an excellent job in my 20 gallon tank. I replace the filter cartridge every 3 weeks and the water has been crystal clear and ammonia free. Excellent product for the price. I highly recommend this product! I have owner Biowheels from back when i was a child. I swear by them. The new cartridges don't seem to be made as well. The foam seams to deteriorate, but many people have suggested just stripping it off and creating your own filter bag. I still love this filter. The Penguin 350B was very quiet for four months, then the impeller started making noise. When it does, you have only weeks or days before it stops working completely. A very good fix is to go to your local hobby shop and rebuild the plastic shaft from copper tubing. It will take a bit of effort but is worth it in the long run. The Penguin bio-wheel filter line is incredible. I have both the 200b and 350b filter on my 46 gallon tank to make sure that it's filter properly. These filters keep the tank sparkling clean and never fail or overflow. However, they are a bit loud until the bio-wheel starts to grow bacteria, then their pretty quiet. If you are looking for a quality bio-wheel filter at a decent price, MarineLand's Penguin filters are the way to go. I have the 200B Penguin filter and it works like a charm. It's quiet and does an excellent job of keeping my fish tank crystal clear. You will need to introduce some ammonia into your fish tank to start the nitrogen cycle before the bio wheel will start working though. Running a Penguin 100B in a 10 gallon aquatic turtle tank (2 baby Red Eared Sliders). Very quiet filter, and capable of holding its own against the tank's unusually messy inhabitants. Rated for 20 gal, its performance in a 10 gal with turtles leads me to believe that it has plenty capability to maintain a 20 gallon with a reasonable stock of fish. Media change is a breeze, but pads are pricy while the filter is first setting up. This filter works tremendously and I have had only a few minor problems with it here and there. Occasionally if your filter cartridge isn't seated properly the Bio-Wheel will stick in position. Usually it will only take an extra second or two to rearrange the filter to get the Bio-Wheel fully operational. The filter leaves your water looking clean and polished very quickly even when you stir things up a bit during a water change.I also found that my tank seemed to have cycled somewhat quicker with the Bio-Wheel compared to a few other tanks I have set up. I have the 200B model, as an upgrade from the old penguin bio-wheel. I was very impressed by the water flow, at least 3x more than I was used to getting. I also like the dual intake.. you can't see it in the picture here, but it has a second intake on the tube about halfway up. I have the penguin 350 on my 55 gallon tank and it works miracles. When I used to clean the tank the water was just plain nasty, now when I do it the water I remove is just about clean. I would recommend the penguin filters to anyone. I have used the Penguin 350B in my freshwater tank and it does wonders. Keeps my tank spotless all the time. Also maintenance is a breeze.I would recomend this filter to anyone wanting a great filter! This is a heavy duty filter that provides my fish with all the valuable ingredients of survival. 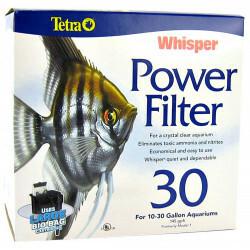 We had a tetra power filter prior to our purchase of the Bio wheel, there is a significant difference between the two. We are able to prolong water changes and we notice the fish are not as irritated by the water when using our Bio wheel. This item is compact, quiet, inexpensive and absolutely worth it. A great buy indeed. 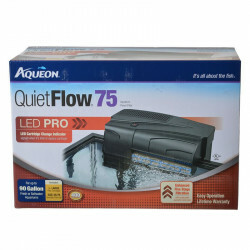 It works excellent with my 10 gallon tank and is great because it is external.